Stand Up To Cancer is a TV show on British national television from Channel 4 with an average rating of 3.4 stars by TelevisionCatchUp.co.uk's visitors. We have 50 episodes of Stand Up To Cancer in our archive. 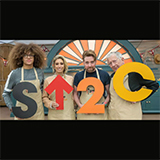 The first episode of Stand Up To Cancer was broadcast in November, 2018. Did you miss an episode of Stand Up To Cancer but don't you wan't that to happen in the future? Please set an alarm and add Stand Up To Cancer to your favourites, so we can remind you by email when there's a new episode available to watch. For free! Davina tasks Jamie and Spencer to create an A-list charity single. Mark Gatiss shares his story and David Mitchell, Jonathan Ross and Bear Grylls on the importance of checking your balls. Emeli Sandé performs a special tribute to the late great Aretha Franklin. Plus Kate Beckinsale, Tom Hardy, Gillian Anderson, Benedict Cumberbatch and Eddie Redmayne. More from Louis Tomlinson and Liam Payne, Danny and Dani Dyer and the other celebs; Liam Gallagher joins live; Matthew McConaughey and John Hamm join in; and a message from Gary Lineker. ...Part Two: Michael Bublé and James Corden star in part two of their SU2C special. Plus Sharon Horgan, Clare Balding, Katherine Ryan, and Little Mix. Starring Louis Tomlinson and Liam Payne, Danny and Dani Dyer and co. Plus an exclusive look at next year's Celeb Bake Off, and Michael Bublé and James Corden pay tribute to George Michael. ...Part One: Michael Bublé joins James Corden for a world exclusive SU2C edition. Plus a special performance from music star John Legend and Poldark's Eleanor Tomlinson and Gabriella Wilde. Some of the star bakers appear live. Plus Louis Tomlinson and Liam Payne, Danny and Dani Dyer, Dele Ali and Eric Dier, and Peter Crouch and Abbey Clancy sit down for Celebrity Gogglebox. Miss Piggy meets Jack Whitehall. Plus the first look at tonight's Celebrity Gogglebox with stars including Louis Tomlinson and Liam Payne, Danny and Dani Dyer, plus music from Tom Odell. Adam Hills, Alan Carr and Maya Jama host a star-studded fundraising night. Celeb Gogglebox, Michael Bublé in Carpool Karaoke, John Legend, Liam Gallagher, Gareth Southgate and many more.